In stock -This product will ship today if ordered within the next 14 hours and 6 minutes. Whole Earth Organic No Caf Coffee Alternative is made with delicious, natural ingredients including barley, figs and chicory. Completely caffeine-free yet beautifully smooth and full-bodied. Sip, breathe deeply and feel bright and breezy. At Whole Earth, they love making the kind of food you love. The kind with nothing but nature added. After all, why tinker with something so perfect? Barley* (38%), malted barley* (27%), chicory*, (23%), rye*, figs*. Sprinkle 1 or 2 teaspoons of No Caf Coffee Alternative into your favourite cup and add freshly boiled water. Add milk if you like and sweeten if you fancy it. 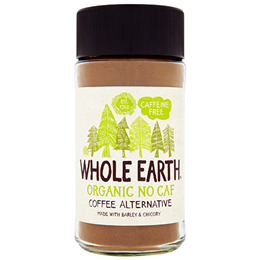 Below are reviews of Whole Earth Organic No Caf Coffee Alternative - 100g by bodykind customers. If you have tried this product we'd love to hear what you think so please leave a review.